Winter weather in much of the Northern Hemisphere is cold. There’s snow. There’s ice. But there also are brilliant blue skies and sparkling vistas. Instead of fleeing to the beaches of the Caribbean, consider embracing the season. Bundle up and head north to Canada, where they know how to do winter right. 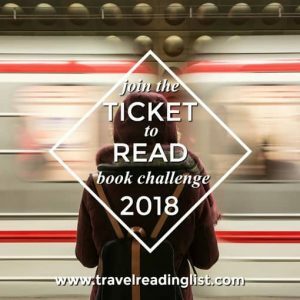 Take Québec City, for example. 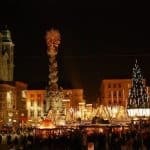 Centerpiece of the season is Carnaval (this year’s dates are January 29 to February 14, 2016), and there’s much to see and do in the provincial capital. First up? Buy an effigy – that’s a fanciful plastic hangtag you affix to your jacket that gives you entrance into all the Carnival venues, from Bonhomme’s castle to the festival on the Plains of Abraham. Who’s Bonhomme? He’s the genial host for Carnaval — the jolliest snowman one can imagine. He turns up everywhere and loves to pose for pictures with visitors. His official “home” for the fortnight is fittingly an Ice Palace. Each year, tourists have taken it upon themselves to embellish this palace, erected opposite the Second Empire style provincial parliament building. To add to the castle décor, bring a coin from home, warm it well (just put it in your mouth for a few minutes) and then melt it into the solid ice of the wall just beyond the exit. 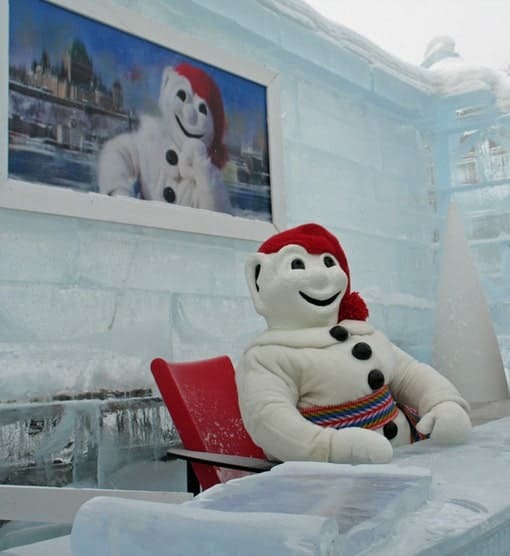 On the Plains of Abraham you can gaze at the International Snow Sculpture Competition, sample some maple syrup drizzled on (clean) snow, take a zip line down a 90-meter-long wire or ride an inner tube down a slide. Throughout town, there are winter-only activities. 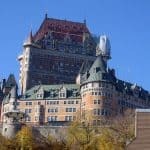 Try a toboggan ride down the artificial hill set up outside the Château Frontenac. Board the ferry as it chops its way through the ice floes of the St. Lawrence Seaway on its regular crossings to Lévis. 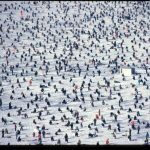 Watch a canoe race (with more than 50 teams this year) across that same frozen waterway February 7, 2016 (which involves almost as much hauling the canoe across ice as paddling in the frigid water). 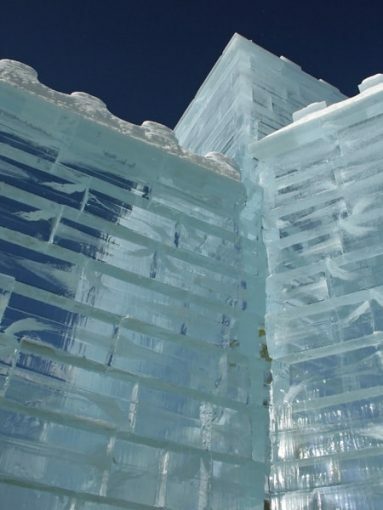 And, speaking of ice, a bit outside town is L’Hôtel de Glace, North America’s own ice hotel where you can spend the night swathed in a mummy bag and reindeer skins. Not ready for a sleepover? Do take a daytime tour. It’s open until the end of March. But, as they say on the infomercials: there’s more. Rent a car and head north for some serious fun in the snow time. Of course there’s skiing. But I don’t ski so that has little appeal for me (other than the whole après-ski-sitting-around-the-fireplace-with-a-mug-of-mulled-wine scene). 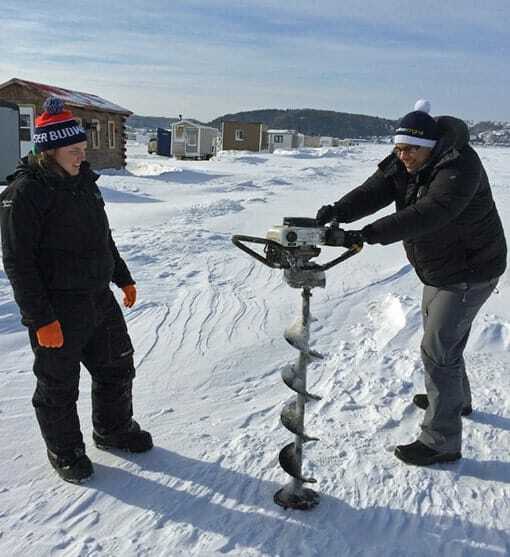 I headed north to the Saguenay−Lac-Saint-Jean region where the offerings include ice fishing, ice skating and snow shoeing. 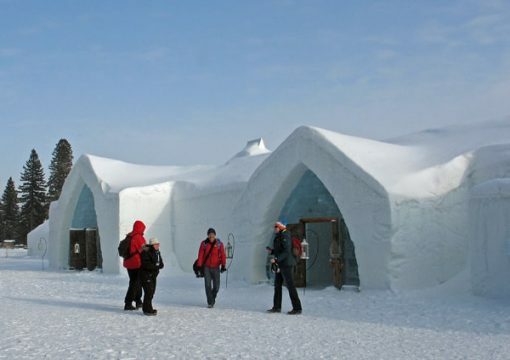 The Village sur Glace is a pop-up town just outside Roberval. 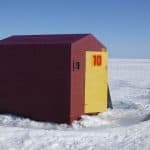 It appears each winter on the frozen surface of Lake Saint-Jean, offering fishing huts for rent as well as a huge skating rink. One of the best places to snowshoe is Parc National des Monts-Valin outside Saint-Fulgence. You can rent showshoes at the Discovery and Visitors’ center. Some 77 km of snowshoe trails radiate from the center, but another option is riding a Snowcat shuttle to the base of Vallée des Fantômes. “Snow ghosts” will shadow your hiking route to the summit. 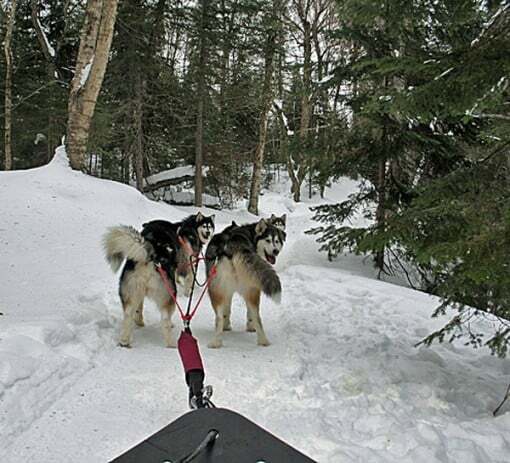 It wouldn’t be winter in Quebec without a dogsled ride. One place to find that experience is Entre Chien et Loup outside L’Anse-Saint-Jean. You’ve never seen a dog happier about snow than a husky being hitched to a sled. There are cozy small hotels throughout the region. I enjoyed staying at these two: Auberge des 21 in Ville de la Baie and L’Auberge des Cévennes in L’Anse-Saint Jean. Some advice on apparel: Yes, it’s cold in Québec in the winter. Really cold. You’ll be a lot happier if you dress for the weather. A long down-filled coat with a hood, a knit cap and a scarf to knot around your neck, long pants, winter-ready boots and warm gloves are obvious necessities. Consider packing snow pants, thermal underwear, wool socks plus silk sock liners, snow goggles and mittens to wear over fur-lined gloves. Disclosure: Susan McKee’s most recent visit to Québec was partially sponsored by Tourisme Saguenay−Lac-Saint-Jean.